Photo credit: Simon & Schuster, FBI, DoJ, DoJ and Buck Ennis / DoJ. The Justice Department is often zealous, sometimes to the point of recklessness, in prosecuting street crime and drug offenses. But it has been dilatory and feckless — our podcast guest this week calls it “chickenshit” — in prosecuting white collar criminals, many of whom helped to bring down the US economy in 2008. Once, not that long ago, the government prosecuted the likes of Michael Milken and executives of Enron, Adelphia and Worldcom. It may have been the golden age of white collar prosecution. Today, executives at Wells Fargo, Goldman Sachs, and so many others that played roles in precipitating the 2008/2009 crash, have escaped the long arm of the law. What happened? What’s changed? In part, it was a backlash to the Enron era. Suddenly, defending executives became an increasingly lucrative practice at elite law firms. This created a revolving door between the Department of Justice and “big law” — with the result that prosecutors and defense attorneys on opposite sides of the table were often the same people wearing different hats. Jeff Schechtman: Welcome to Radio WhoWhatWhy, I’m Jeff Schechtman. Years ago you may remember that the presidential candidate and former US Senator John Edwards spoke of two Americas — one poor and one rich and powerful. The same might very well be said of America’s justice system — one which is zealous to the point of recklessness in prosecuting street crime and drug offenses; and the other that is benign and feckless in prosecuting the white collar crimes of many that have deliberately and criminally wrecked our economy and hurt real people. But this hasn’t always been the case, where once, not that long ago, the US prosecuted the likes of Mike Milken, the executives of Enron and Adelphia and WorldCom. Today, executives at Wells Fargo or Goldman Sachs or so many that clearly were responsible for the potential criminal acts that caused the 2008/2009 crash have escaped the long arm of the law. Why is this the case? What happened? What’s changed? And are the same forces that have given us our economy of two Americas also been responsible for two justice systems? We’re going to talk about this today with my guest, Jesse Eisinger. He’s a Pulitzer prize winning senior reporter at ProPublica. His work has appeared in The New York Times, The Atlantic, and The Washington Post. He was previously the Wall Street editor of Conde Nast Portfolio and a columnist for The Wall Street Journal. It is my pleasure to welcome Jesse Eisinger here to talk about his book “The Chickenshit Club: Why the Justice Department Fails to Prosecute Executives“. Jesse, thanks so much for joining us. Jesse Eisinger: Thanks for having me. Jeff Schechtman: The title of this book actually comes from a speech that Jim Comey gave. Tell us a little bit about that ’cause it really does set this up. Jesse Eisinger: Right, so your listeners will know Jim Comey from being recently fired as the FBI Director by Donald Trump, but 15 years ago he became the US Attorney in the Southern District of New York. The Southern District of New York, you have to understand, is the premiere office of the Department of Justice. It is where corporate crime is prosecuted the most — especially securities crime. He gathered all the criminal prosecutors together and these guys are really the best of the best — best schools, best clerkships — they think of themselves as the best, too. He gives them a speech and he says, “How many of you have never lost a case?” And a bunch of hands shoot up ’cause they’re brimming with pride at their records. Jeff Schechtman: And was it a reality of the time that in fact there was this sense of wanting to win more than doing justice? Jesse Eisinger: Well, it always plagues the Department of Justice. They always want to win and you win by racking up cases against low-hanging fruit and people can’t defend themselves very easily. So, you know, what I say in the book is that there’s never been a golden age where if you were rich and powerful and breaking the law you were sure to go to prison, and you had no resources or political influence to bring to bear, but there have been silver ages where we used to do a little bit better, occasionally, and you mentioned a couple of instances with Milken and after Enron. Now we are in the bronze age or the stone age, where we just do not know how to do this anymore. We’ve lost the will and ability to prosecute top corporate executives. Jeff Schechtman: One of the things you talk about is that there’s been an almost cyclical nature to this. That after these prosecutions, particularly the Enron prosecution, there was, among the white collar bar in particular, a kind of push back to the government for over-prosecuting some of these cases. Jesse Eisinger: Exactly. That’s why the Justice Department has lost their will and ability. There was an enormous lobbying effort and pushback from corporations and the white collar bar in Washington, DC over the last decade and a half. The result of it is that they stripped prosecutors of tools that they used to prosecute corporate crime. They won in courts, so they used a legal strategy to challenge and appeal a lot of decisions. The appellate courts had been very friendly to them. They succeeded in changing the culture and the mindset of the Department of Justice. Now, what we do is we settle with corporations for money instead of prosecuting individuals. Jeff Schechtman: How much of this has been the result of these cases and the alleged crimes and the financial dealings becoming so much more complicated and so much harder to prosecute? Jesse Eisinger: I don’t buy that excuse, although you do hear that very often. You hear, “Well, this is so complicated. It’s opaque and we … These things are in gray areas and juries would never understand.” That’s a very common excuse from prosecutors. But Enron was complicated. There is nothing more complicated in the history of corporation, corporate accounting fraud than Enron, or it’s one of the top ten. They successfully prosecuted that. The job of prosecutors is to cut through the arcana and the complications. That’s what Wall Street and corporations specialize in in order to obscure their frauds. Not all complicated things are fraudulent, but almost every fraud is complicated. So you have to cut through it and figure out what the lies are and then figure out how to tell that story to a jury. They don’t do that well anymore. Jeff Schechtman: One of the other areas that you talk about, more than not doing it well anymore, is this kind of symbiotic relationship that exists between those in the Department of Justice and those in large, high profile law firms and guys that are going, and women as well, back and forth between the two all the time. In fact, we’re seeing that today and the fact that that’s playing into this as well. Jesse Eisinger: Yes. This is a major problem. I don’t think the revolving door is the only problem, but it is certainly an enormous problem for justice in American society, for corporate criminals. Today, the Department of Justice is essentially treated like a training ground for future partners of big law firms. So, young prosecutors, the ablest and smartest lawyers in the land, go to become prosecutors. They work there for six or eight years. They move up the chain and the ladder and then they go to become partners. When they’ve risen up the ladder at their firms, they go back to run the same departments that they used to work in, so the Department of Justice or the FCC, and this is enormously corrosive because they’re all drawing from the same milieu, the same environment, both democrats and republicans. They don’t see corporate criminals as criminals, they see them as people who need slaps on the wrists and occasional fines. Jeff Schechtman: How much of this is also a result of a kind of cultural shift in our attitude towards corporations? Jesse Eisinger: Well, I would think that the general public doesn’t have much of a cultural shift towards corporations. If anything, the general public is more skeptical and more angry about faceless giant corporations … untouchable by sort of consumer input or … and the workers think they have fewer rights, but in the elite circles of big law and government now, we have an enormous amount of, I think, elite affinity about executives. There’s one example in my book where I go through how Goldman Sachs was prosecuted and investigated for its mortgage security dealings, and what I uncovered is that there was an email from a top FCC official who said, at one point, “Remember, these are good people who have made one bad mistake.” That’s an attitude that permeates the regulatory firmament and structure in this country. And are these people good people fundamentally? Have they really made one mistake? This is the way they think of them. And it’s true. The Goldman Sachs and J.P. Morgan bankers are articulate, and well educated, and thoughtful, and cultured. So they don’t come across as greasy scumbags, but in fact they make more than one mistake and sometimes they’re not making mistakes — they’re doing it on purpose to take advantage of customers and frequently they’re lying, and deceiving, and defrauding to do that. Jeff Schechtman: How much of it is impacted by campaign contributions and corporate money in politics today? Jesse Eisinger: Well, I think it’s inextricably linked. I think it’s very hard to disaggregate to come up with an actual figure or … This is all pretty opaque, but corporations donate to politicians and politicians have certainly not done anything to strengthen the hand of prosecutors when they’re prosecuting corporate crime. Symbiotic relationship between big law and the Department of Justice and the regulators doesn’t require giant donations from wealthy individuals in an opaque way, but it certainly doesn’t … nobody’s resisting it through that financial and donation system. Jeff Schechtman: It does seem though that the attitude towards corporations, which grew out of things like Citizens United, are somehow connected to all of this. Jesse Eisinger: Well, I will make a distinction between the public attitude about this and the legal attitude. So the law has expanded corporate rights, corporations and persons under the law, and they have steadily been expanded in the Roberts Court. There was an academic finding from Richard Posner and a couple of his colleagues — Richard Posner is the eminent judge … an appellate court judge. He found that the Roberts Court was the business-friendliest court in modern history. There absolutely is an effort to expand corporate rights. One of those ancillary benefits of that is that they’ve been expanding the rights of corporate criminals and those who are indicted — white collar defendants and white collar criminals. They have steadily turned away, reversed prosecutions. They have thrown out useful statutes that prosecutors use to prosecute these people. So there’s been a steady erosion of the prosecutor’s toolkit when it comes to white collar criminals. Jeff Schechtman: One of the things that we’ve certainly seen is the degree to which almost everything in our society today, from the smallest to the largest, has become so politicized. In many ways, this whole idea of attitude towards corporations and the potential of the government to prosecute them seems to be caught up in this as well. Jesse Eisinger: Well, I think that that’s true, except that the democrats, who run the Department of Justice, ran the Department of Justice under President Obama, did not have a particularly ideological or antagonistic relationship toward corporations, so we might appear to be living in a polarized society with strong differences, but when it comes to corporate rights and corporate regulation, the democrats are not that different from the republicans. The republicans are significantly worse, I don’t want to pretend that … I’m not going to sit around and say that both sides are equal or equally bad, but the democrats are not driven by some ideological fervor to regulate corporations anymore. They’re driven by kind of technocratic fixes within the framework of thinking that corporations are essentially good or deserve their power and their position in society. We didn’t see the Obama Administration cracking down on corporate crime. We didn’t see them enforcing antitrust regulations and we didn’t see them really regulating financial markets in a way that was particularly strict, so you do see these ideological splits in the American public, but it’s not really reflected in the way we govern. Jeff Schechtman: You’ve talked a couple of times about public attitude and certainly public attitude towards corporations, which is not always terrific, and yet that hasn’t seemed to make any difference particularly among the political class. Jesse Eisinger: Well, yes and no. I think it made an enormous difference in the last presidential election. I think my view is that Americans looked at the financial crisis — and the financial crisis is still with us. The financial crisis, of course, immiserated millions of Americans. People lost their homes, lost their jobs. And no one was held accountable. The public doesn’t understand the nuances of a deferred prosecution agreement or what a collateralized debt obligation is, but they understand, “I don’t see anybody going to prison and there is something wrong here, dealing with some deep rot.” And when Obama tried to reform the system, they didn’t believe it because no one was held accountable. When Hillary Clinton campaigned on cracking down on corporate criminals, individuals, no one believed it because she’d given those speeches to Goldman Sachs, but then when Donald Trump ran against Wall Street and said that Hillary Clinton was in the pocket of Goldman Sachs, people did hear that — it did resonate. And of course that was a terrible con job; a spectacular lie because he installed multiple Goldman Sachs bankers in high level positions in his cabinet, but you did see him take advantage of this anger. Jeff Schechtman: How has Wall Street dealt with all of this? Talk a little bit about the attitudes on Wall Street with respect to this changing landscape that we’ve been talking about. Jesse Eisinger: Well, I think that they’re thinking two things. One, that they think they dodged a bullet because I think most of them expected that many of their colleagues would in fact go to prison for this. Two … I think they saw relief for … that was one thing. Then immediately relief turned into entitlement and you’d seen the pervasive kind of whining and complaining about the onerous regulations that were imposed post-financial crisis. This is a pretty audacious tax since I don’t think that the regulations were onerous at all. Banks are back to making record profits. The business is changing on Wall Street, so people are feeling a little bit insecure, but that really has little to do with regulation and a lot to do with technology and a lot to do with customer needs. If you rip off customers, customers are going to move away from you. They’re going to learn. So, Wall Street now is back to record profits, but uneasy because of forces that have very little to do with regulation. What they are doing is trying to loosen the regulations under Trump. Jeff Schechtman: Is there a difference in terms of what we’ve seen happen with respect to prosecution and also public attitudes, as you understand it, is there a difference between Wall Street, how it acts, what it’s done, and other corporations outside of Wall Street that have committed crimes? Jesse Eisinger: No, and the point of my book, which walks people through a little bit of its history and covers a lot of the characters and people who have tried to police corporations throughout recent history — some of the heroes. The fact is that my book is not about banks and not about the financial crisis, this is a problem that plagues all giant corporations. Prosecutors when they’re trying to take on all kinds of corporations, industrial corporations, retailers, tech companies, pharmaceutical companies … and we have seen them failing … even starting to fail before the financial crisis and that persists to today. Instead of prosecuting top executives from pharmaceutical companies, we settle for money. There’s a settlement culture here and it persists. That is very damaging and goes beyond the banks. Jeff Schechtman: What impact has it had, as you see it, in other aspects of the justice system and the criminal justice system? Jesse Eisinger: Well, as you examine the conversation, we had a two-tier justice system in the country where we disproportionately punish the poor for often things that are nonviolent, nonviolent drug offenses, people of color … and that system badly needs reform. In the meantime, we do not punish enough rich, powerful, often white men, and this erodes the sense of fairness. It erodes the legitimacy of our government. It makes people think that we are not living in a just society, so I think people can see right in the truth in front of them. What I was trying to do is explain how we got there. Jeff Schechtman: So, the extent to which it is trickled down into other parts of the justice system, do we see it, for example, in smaller white collar crimes that are committed on the state level and in communities? Is this attitude that we see writ large filtering down? Jesse Eisinger: Well, they do punish white collar crime, it’s just they do a lot less of it. 15 years ago, the Justice Department prosecuted white collar crimes one in five cases — today it’s one in ten. Who are they prosecuting? That sort of overstates even what they’re doing because they’re not prosecuting high level people. What they’re doing is they’re doing a lot of low level crimes, and when they do those kind of cases, they throw the book at those people. In the wake of the financial crisis, they did a lot of cases against two-bit mortgage fraudsters who were lying about the set value of their buildings …. here and there — couple hundred thousand dollars here, couple hundred thousand dollars there. That kind of thing. So, when they do these cases, they crack down on them very hard and give very long sentences to kind of overcompensate, which itself is an unjust system because white collar criminals, frankly, don’t need to be put into prison for 15, 20 years. They’re not an ongoing threat to society very often and they’re certainly not violent and the message can be sent with lower prison terms, so one of the reforms I think is that they should not charge white collar criminals as many charges as they do and seek lower sentences, but just to seek more of them. We should put more white collar criminals in prison for shorter periods of time. Jeff Schechtman: With respect to the federal system and federal prosecution, how high up did these attitudes go? Jesse Eisinger: Well, I don’t have in my book any smoking gun where Timothy Geithner or Barack Obama ordered or called them to stand down and I don’t believe that happened, but I do think that it permeated the Obama Administration kind of attitude. Timothy Geithner at one point said, “Well we don’t want to have Old Testament justice.” The kind of smearing idea that punishing a few bad apples wasn’t going to fix anything and Eric Holder, of course, famously said that corporations were … He didn’t literally say this, but he effectively said that they were too big to jail. That they were too big to really prosecute adequately. That was a pervasive attitude — the wrong attitude — but it shows where they’re coming from. They wanted systemic reform and what they didn’t understand is that if you have systemic reform without punishing bad actors, without holding people accountable, it undermines the legitimacy of that systemic reform. 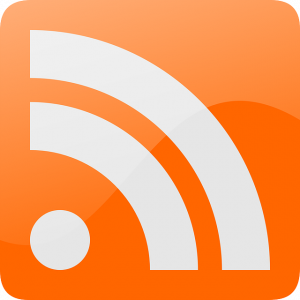 Jeff Schechtman: Is there any reason to think that the pendulum may start to swing at some point in the other direction? Jesse Eisinger: Well, as you just heard, I’m a pretty big critic of the Obama era and the Eric Holder era, and I think Jeff Sessions DOJ will likely be the worst in history, worse than modern times for corporate crime especially. Now, who knows, Jeff Sessions could be gone in a week and so we’ll have to figure out who the next AG is, but Sessions has already given a lot of indication that he doesn’t really care about corporate crime, that his priorities lie elsewhere. That they lie with cracking down on drug offenders again, about undoing the reforms of the Holder era, the reforms of the Holder era in drug enforcement were very good and I laud them and it would be a terrible shame to see them reversed. He’s going to crack down on immigration crimes — these are all very bad developments, I think bad for society, and bode ill for white collar crime. I think … The best case scenario is that they neglect white collar crime — the worst case scenario is that they somehow try to really deprive white collar prosecutors of tools to even do what they’re doing now. Jeff Schechtman: What will it take, in your view, for the public to sort of get to critical mass on this and really care about it? Jesse Eisinger: It’s a very difficult issue, thorny issue for the public because we don’t have direct representation about this. You have to sort of get your elected representative to care about white collar criminals. If people did make their voices heard and said, “We’re very angry about the lack of prosecutions,” then you could see Congress stepping in to give the Department of Justice more resources. I don’t think resources are the crucial issue, but I think they are under-resourced in this area. Fund the FBI’s efforts to crack down on white collar crime. There’s been a switch in the funding and priorities of the FBI, so they don’t do this anymore that much. They’re more of this kind of anti-terrorist organization now. And then kind of do a study to figure out what kind of statutory powers they’ve lost over the past 15 years and what they need and how they could address that. How they could restore some of the statutes that they need to use to prosecute these kind of crimes. Jeff Schechtman: And finally, do you see any nexus in terms of what public attitudes might evolve to from where we are now in terms of this focus on potential white collar crime at the highest levels, and Comey, and Mueller, and everything that’s going on now … To what extent the polarization and attitudes may affect these things that we’re talking about with respect to white collar and corporate crime? Jesse Eisinger: You make a good point. I think those are going to be seen through an ultra partisan lens and we’ll be extremely divisive if … If Robert Mueller successfully brings indictments, especially indictments against Trump or Trump family members — Donnie Trump Jr. — that kind of thing. I think it’s inevitable that those will be seen by 20% to 40% of the population as illegitimate. I highly doubt if Robert Mueller brings those charges that they would be illegitimate. I think he is an able, capable, honest broker and a serious law and order man. He’s stocked his team with very good able prosecutors, some of them who prosecuted Enron who was the last high watermark for these kind of prosecutions. To your point, we’re living in a highly partisan time. FOX News is not going to turn around on a dime and say, “Look at the evidence and carefully weigh it and then decide whether there’s a good case here,” Who are we kidding? They’re going to be living in their alternate universe of fake facts. There will be some honest brokers, some conservatives, law and order conservatives who will accept the facts if the facts are there, and I’m not presuming that they are right now — I’m just speaking hypothetically. But, you know, we’ll have to wait and see for that. Jeff Schechtman: But to that partisanship, finally, one wonders the degree to which it will impact attitudes towards prosecutors in general and towards government prosecutors specifically and how that partisanship will filter into potential future issues with respect to corporate and white collar crime? Jesse Eisinger: Well, that’s a good point. There’s been an evolution in the republican view of prosecuting white collar crime, and their old view, which I walk through in the book, exemplified by Robert Mueller and by Larry Thompson who was the Deputy Attorney General under Bush who helped start the Enron task force. Larry Thompson is an African American who grows up in segregated Missouri and becomes a Goldwater Republican, of all things — very unlikely story. But he has an attitude about law and order. He believes that capitalism needs to be saved from bad capitalists, and by doing that they need to prosecute bad actors. Some of the heroes of my book, like Thompson and Stanley Sporkin, Director of Enforcement in the FCC in the 70s, were republicans. They had this attitude. But in the last 20 or 30 years, there’s been a rise of a new kind of republican ethos — a libertarian ethos that was very skeptical about government power. And as that infected the judiciary, and I think this has been a malign influence, they have decided that there’s government overage, and that prosecutors are cowboys and they’re too aggressive. They’ve primarily viewed that through the lens of their prosecutions of white collar criminals and corporate criminals and stripped prosecutors of the power there. So yes, if those partisans get into power and they see prosecutions … Mueller trying to prosecute, they may reverse those and in fact we might see Trump try to fire Mueller. I wouldn’t be surprised at all. Jeff Schechtman: Jesse Eisinger. 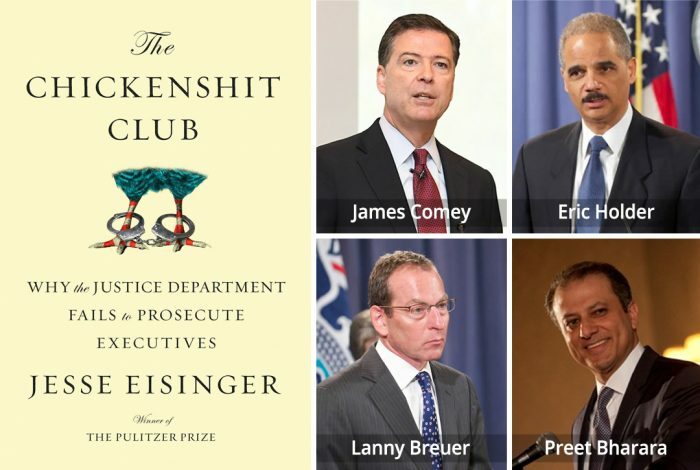 The book is “The Chickenshit Club: Why The Justice Department Fails to Prosecute Executives“. Jesse, I thank you so much for spending time with us here on Radio WhoWhatWhy. Jesse Eisinger: Well, thank you. I really enjoyed it. Related front page panorama photo credit: Adapted by WhoWhatWhy from seal (DoJ / Wikimedia) and Spirit of Justice (Carol M. Highsmith / Library of Congress).